According to the latest report by Research2Guidance, a normal weather app at the Android market is the most profitable than any other app. At the end of August 2011 the average application had earned nearly $2500 since its publication. Nearly 25% of all apps downloaded in Android market are games but intense competition brings down the potential revenue of the app. So, the smallest category of Weather apps has generated by far the highest average revenue per app in the store. There are already many apps and the use-case of the app is very specific, so further developing of new apps is difficult for developers. This brings developers to the Business category and this could be an optimal choice for them. 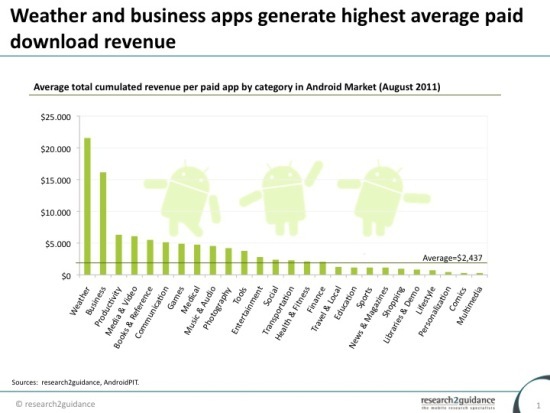 It currently contains 7,000 apps and only 13% of them are paid; and users don’t mind paying for a good app. Many other categories have very low average revenue, because users prefer to download free alternatives, or are not much willing to pay more than a dollar for ringtone or wallpaper download.